Lori Howe, a University of Wyoming doctoral candidate in literacy studies, will read selections from and sign copies of her new book of poetry, titled “Cloudshade: Poems of the High Plains,” Saturday, Dec. 12, at 6 p.m. at Night Heron Books, located at 107 E. Ivinson Ave. This free event is open to the public, and refreshments will be provided. 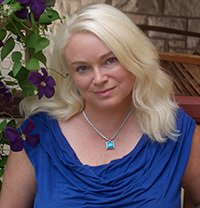 Howe, who has an MFA in poetry, is the editor in chief of “Clerestory: Poems of the Mountain West” and the author of “Voices at Twilight.” Her poems from “Cloudshade” have been nominated for a Pushcart Prize, and the collection also has been nominated for numerous first-book awards. Howe is a leadership team member for the Wyoming Writing Project, a chapter of the National Writing Project, and teaches creative writing workshops with underserved writing populations across Wyoming. This event is part of a series of readings and signings across Wyoming and Colorado. She also will teach a free writing workshop in Jackson from 9 a.m.-noon Saturday, Dec. 5, at the Jackson Hole Center for the Arts, and will be part of the Wyoming Humanities Council Writing Workshop tour next summer. Howe’s Laramie event is sponsored in part by the UW Creative Writing Program. To learn more about the program, visit www.uwyo.edu/creativewriting. For more information, contact Dominick Duhamel at (760) 803-3912 or dduhamel@uwyo.edu.